I’ve been interpreting Native American culture to the public as a free community service for ten years. I do this because I enjoy teaching people how the Native Americans survived and thrived as a culture. As a facilitator, I work with organizations that also want to survive and thrive (Visit my website at www.tomromito.com). In those sessions, I ask for a modest fee of $25.00 per hour, whereas I don’t ask for a fee for my Native American sessions. Recently, I conducted a one-hour interpretative program at University Hospital’s Parma Elder Center (http://goo.gl/A11GrT). There, I put my facilitation skills to use to connect with a challenged audience. 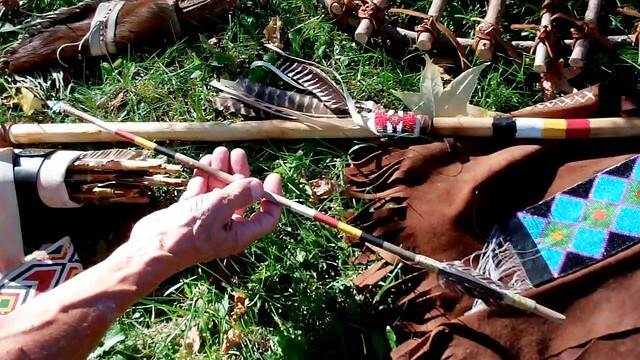 The Elder Center invited me to give an Native American program because I had given one there a few years before. At that time, I visited the center when I took my father there to spend a few days with The Club, a structured program for people with mild cognitive impairment (https://goo.gl/22lvoL). The Elder Center staff told me that my audience was going to include their clients with Alzheimer’s Disease (https://goo.gl/RdHf9d), as well as those in The Club. The people in The Club, all elders, are fairly high-functioning, while those with Alzheimer’s are not. While I had previously experienced a high degree of engagement with the clients in The Club, I was a little apprehensive about how I would engage those with Alzheimer’s. So I developed a strategy of using my facilitator skills to draw them out. I also trusted my instinct that showing these people things that they could touch, see, and hear would engage and delight them. I’ve made most of the Native American artifacts that I display at my interpretive sessions myself. I’ve bought some in stores and received others as gifts from friends who are also Native American enthusiasts. When I brought out these artifacts for the Elder Center audience, eyes began to light up! They were entranced by my atlatl, bow and arrow, spear, stone axe, sheath knife, and war shield. I walked about the circle of chairs the audience was sitting in and let everyone see these items up close and touch them. They were thrilled when I played my drum and rattles, chanted a Native American tune, and performed a feather wand dance. I got the inspiration to ask if anyone thought he or she could play my drum. One person eagerly did, and I showed her how to do it. She quickly mastered the drum beat and I accompanied her with rattles, chanting, and dancing. This engagement and interaction really thrilled the group! Whenever I started to talk, I lost the attention of some people. One client afflicted by Alzheimer’s would slump over, fast asleep. When I began to play my Native American flute, though, she woke up, smiled, and swayed with the music. She hung on every note I played! I think the hallmark of the hour was showing the group Native American sign language. I signed and translated “Seeing you makes my heart glad.” They liked that. Then I signed how Indians might have traded beaver pelts with French fur trappers for gunpowder. I closed the hour by showing them a blessing in Indian sign language. I signed and translated “May the Great Spirit go with you.” Then I taught them how to do it. Everyone participated in signing the blessing! My facilitator skills and belief that I could connect with this audience served me well that day. I learned about another factor that influenced the success of the hour. I guess that’s another reason I was able to connect with this audience. It’s now worked for me with everyone from Cub Scouts to those afflicted with Alzheimer’s Disease.